Happy Friday! Are you looking for a magical dining experience that is delicious, waterfront and comes with a spectacular sunset? You will find all of that at Hyatt Regency Clearwaters restaurant SHOR American Seafood Grill. Gabe and I were invited to dine at SHOR this past week and I have to start this off by stating that this was one of the best meals we have had - hands down. Everything from the ambiance, execution and presentation was complete perfection. Chef Cary Roy and his team prepared an amazing dinner. We will surely be back to visit again and I know where to send my family to stay next time they are visiting. The entire staff was polite and accommodating. 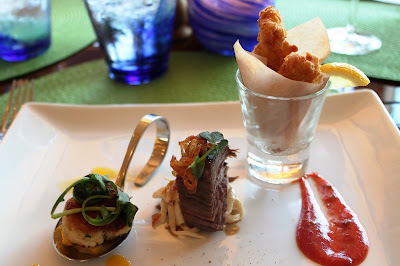 We learned that the Chef would bring out an appetizer trio, showcasing three of his most popular dishes. Prior to the trio arriving, we were presented with a pretzel bread loaf with mustard and butter with sea salt. We had to refrain from eating the entire loaf. As soon as I saw the presentation for the appetizer trio, I knew we were going to be in for a real treat. From left to right - SHORs award winning American Blue Crab Cake with corn puree, arugula, smoked red pepper coulis. Ybor Gold Beer Braised Short Rib with creamy celery root slaw, fried shallots. Fried Calamari with lemon, jalapeno cocktail sauce. All three appetizers were delicious and we didn't leave a trace of the three on our plate. My favorite of the three was the crab cake, while Gabe's favorite of the three was the short rib. 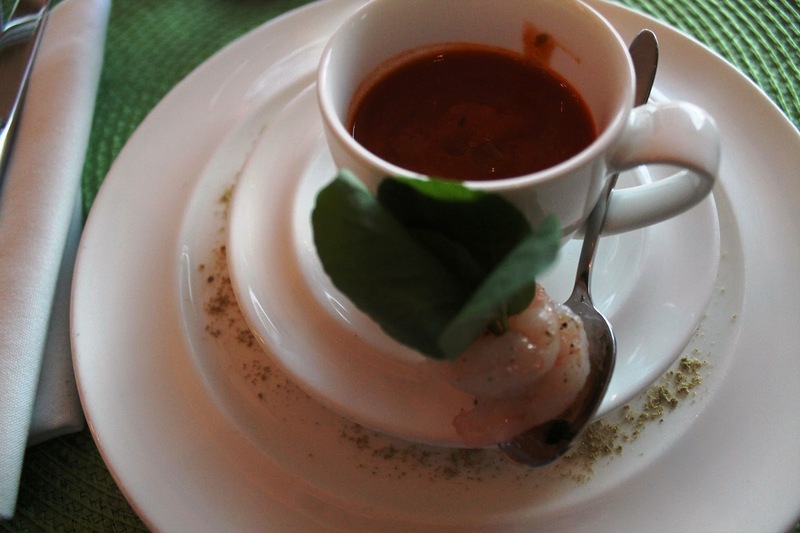 Up next was a cup of Key West Shrimp & Tomato Soup with shaved fennel. I could smell the fennel the second the soup was placed on the table. With each bite, the soup was even more delicious. It was very earthy with a hint of heat. Around the time we finished our soup, it was time for the sunset. It truly felt like like we were watching a live post card. 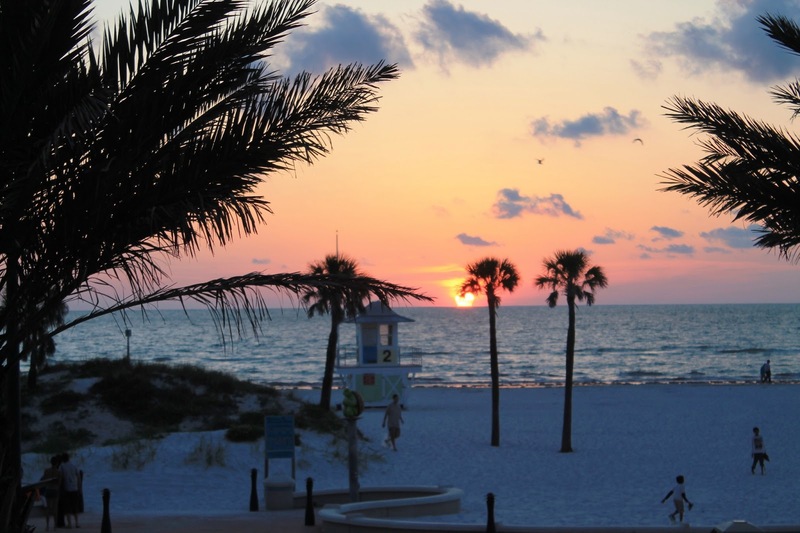 It is no wonder to me that Clearwater was voted Americas #1 beach (I was born and raised at the Worlds most famous beach). It came time to select our dishes. Everyone we spoke with had the same three suggestions - Lobster Mac Cheese, House Made Lobster Ravioli or the Blackened NY Striploin & Pasta. I knew without question that I was going to order the Lobster Mac and Cheese while Gabe struggled between the Lobster Ravioli and the Blackened NY Striploin. 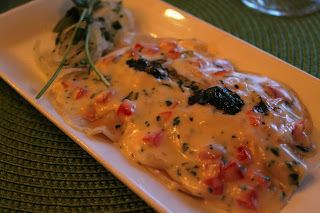 Gabe chose the Steak but the extremely accommodating team at SHOR brought us out a sampling of the Lobster Ravioli. This was unlike any ravioli I have ever had. Instead of pasta, Chef uses wontons, allowing you to truly get the texture and taste of the Ravioli. The pillows were stuffed full of lobster and it was accompanied by a vermouth cream. It was absolutely delicious. 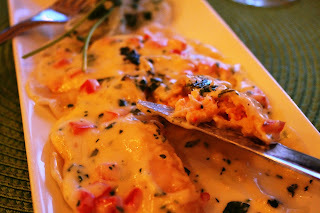 By far the best lobster ravioli either of us have tried. We would both order this dish. 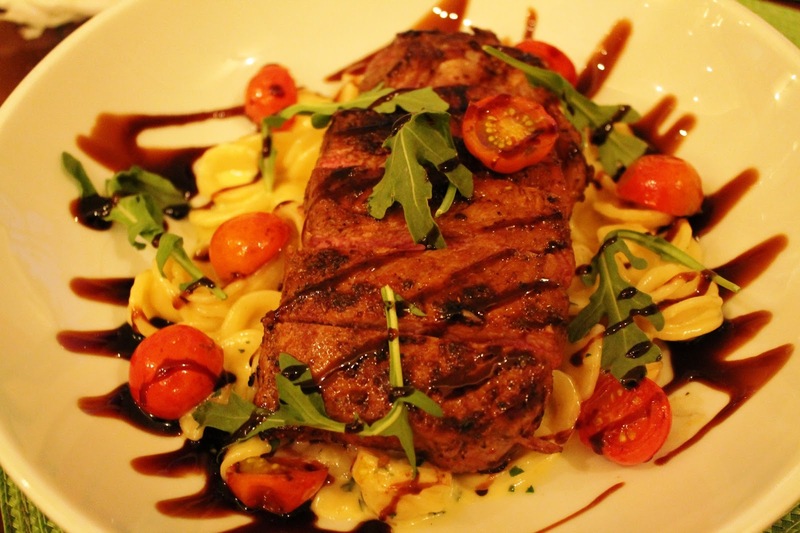 Onto Gabe's steak - a Blackened NY Striploin & Pasta with orecchiette pasta, sweet cherry tomatoes, local "bleu sunshine" cream and a balsamic drizzle. The steak was cooked to perfection and was very tender. It practically melted in your mouth. I am not a huge fan of bleu cheese but it really shined in this dish. I saved the best entree for last. Lobster Mac 'Cheese, Maine lobster, oven dried tomatoes, organic baby spinach, white cheddar cheese sauce, topped with a Maine lobster tail. Every bite made my eyes cross. It was stunning and delicious. Plus it's large enough for leftovers, making a delicious lunch today! I told Chef Cary that my #1 favorite meal ever was an authentic Maine Lobster Roll in Maine at a Ice Cream shoppe named Tubby's. I still dream about that sandwich two years later (and am hoping we have a family reunion this year so I can get my fix). 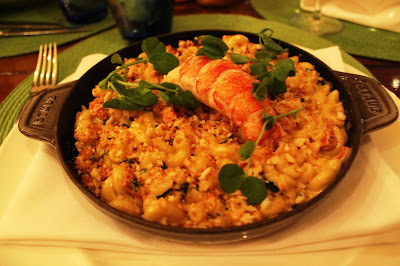 SHOR's Lobster Mac 'Cheese is the second best thing I have ever ate. This is not an exaggeration and I will stand by my word on this. 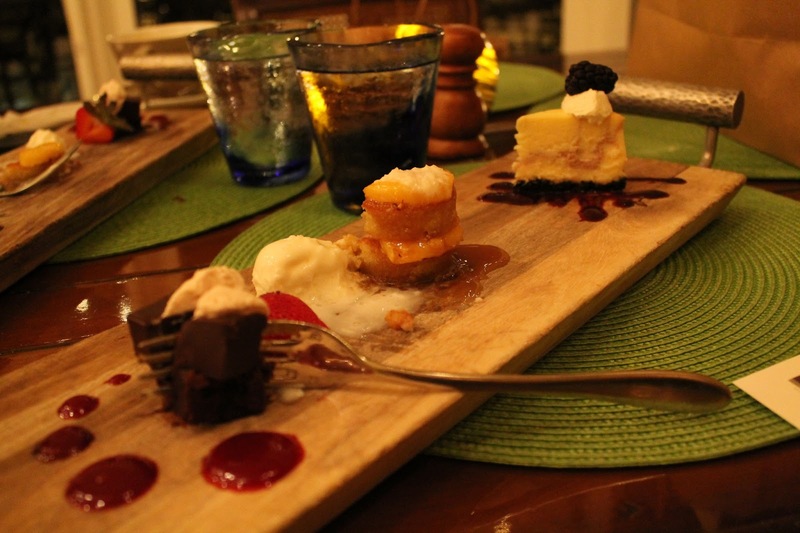 Go to Clearwater ASAP and order this dish..
Now that I cannot possibly eat anymore food, out came a dessert trio. Thankfully Chef Cary knew how full we were and gave us bite sized portions of three desserts. I was so busy talking about Lobster Rolls with the Chef that I forgot to take a photo of the dessert before I put my fork in it. From left to right, Flourless Chocolate Cake with strawberry foam, Pineapple Upside Down Cake with coconut gelato, Blackberry Cheesecake with spiked blackberry coulis. Of the three, I loved the Blackberry Cheesecake most - it was the most authentic NY Cheesecake I have had outside of NYC. One would probably ask - if I wasn't writing a review for SHOR, would I still have the same dining experience. I would say yes. I have had the gracious opportunity to work with many restaurants over the past year and this experience stood out. Disclosure: I was provided with a free meal in exchange for my honest opinion. As always, all thoughts and opinions are my own. The views alone would make for a great night. 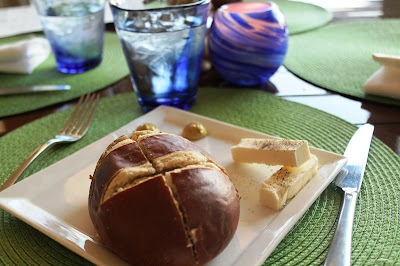 I would have been happy staring out the window with a loaf of pretzel bread all night long! code with HTML. I'm starting a blog soon but have no coding skills so I wanted to get guidance from someone with experience. Any help would be enormously appreciated! Now why didn't my hubby think of flying me down for Mother's Day???? 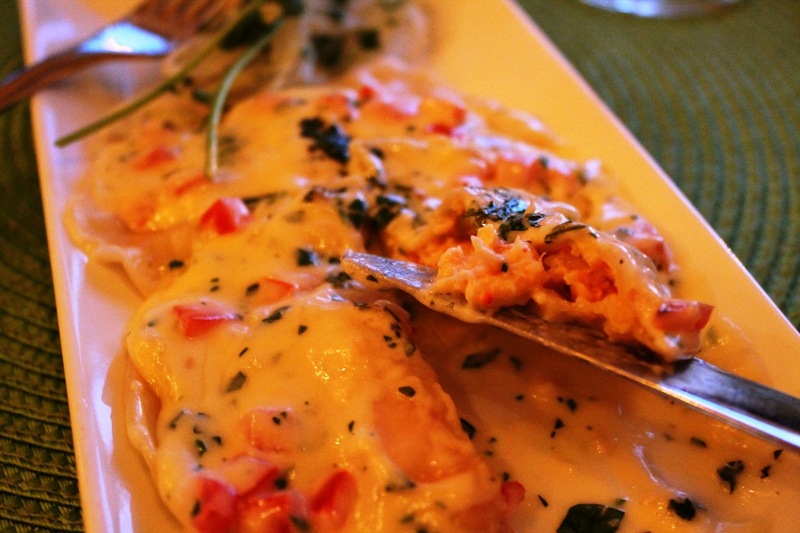 That lobster ravioli would make it worth the trip! Yummm - that definitely sounds like an incredible meal...with an amazing view! I keep meaning for us to make a reservation for dinner at SHOR! I must say (and you know I don't give out compliments easily) this was *quite* the well-written piece Miss Wood! I absolutely loved all of your descriptions...and reactions!! That lobster mac n cheese sounds SO delicious....as does that lobster ravioli. I need to get here....such a stunning view too!